Needham players gathered to their state championship after beating Amherst. The All-World forward was an unstoppable force in Needham’s run to a state title. His 118 career points are a school record as are his 45 points as a senior. The Bay State co-MVP and two-time All-State selection will play at Providence in the fall. The Buccaneers’ one-loss regular season and the emergence of the junior striker are no coincidence. An EMass and All-State selection, he scored 15 goals, had 6 assists, and was name Dual County League MVP. Canterbury scored 33 goals to become the second Bourne player to score 30 or more in a season. The EMass All-Star finished his career as a Canalman with 51 goals and 21 assists and was a four-time scholar athlete award recipient. Bui earned co-MVP honors in the MBIL this season, helping Newman to a second-place finish in the league by potting 10 goals. 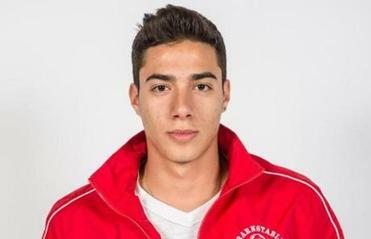 He is also a member of the tennis and swim teams, and enjoys pool and piano in his spare time. He hopes to play college soccer. The two-time captain of the Mustangs more than doubled his career point total with 13 goals and seven assists en route to Tri-Valley and South sectional titles, as well as league MVP honors. The senior forward also was named to the All-State and EMass All-Star teams. The All-State senior forward sparked Somerville’s playoff run with seven postseason goals. He finished with 31 goals and was an EMass All-Star and All-State selection. He was also named a Greater Boston League All-Star for the third time. The three-sport standout commanded the midfield in his senior season while also stepping up and striking for nine goals and five assists. He led the Wildcats to an undefeated Middlesex (Freedom) League title, earning MVP honors. At center-mid the senior had a team high 11 assists to go with 12 goals and was named Merrimack Valley Conference MVP. A strong defensive presence, his all-around play garnered EMass All-Star and All-State honors. Only a sophomore, Herivaux collected his second straight EIL MVP award, tallying 12 goals and 15 assists, to run his career totals to 16 and 25, respectively. His efforts helped Beaver Country Day go undefeated in league play and capture the EIL title. Marshfields’ four-year starter was named All New England this fall along with being the Atlantic Coast League Player of the Year. The three-time ACL All-Star and two-time EMass All-Star scored 57 goals and recorded 23 assists in his career with the Rams. He’ll attend Brandeis. The sophomore posted 27 goals this season, leading Covenant Christian to the top spot in the MBIL Division 2 class. In his three seasons he has netted 75 goals. Also a member of the school’s basketball team, he hopes to play Division 1 soccer. The school’s career leader in every offensive category, Lewis tallied 33 goals this season to lead Berkshire to the Class A NEPSAC championship, where he scored two goals in the clincher. The high school All-American is also a member of Bermuda’s national team. Lyman was a defensive stalwart in the middle for Waring, helping his school to the second-lowest goals-against average in the league. He was named defensive MVP for the MBIL this season. A three-time league all-star, he was also the league MVP in lacrosse. In four years as a varsity forward he helped the Wildcats to two South sectional finals. As a senior captain he was named Co-MVP of the Bay State league after scoring 21 goals and adding 11 assists. He was also named to the EMass All-Star and All-State teams. The All-American goalie notched 14 shutouts as a senior, giving him 40 in his career. His 0.39 goals against average was lowest in the state as he picked up Hockomock MVP, All New England, All State and EMass All-Star honors. He will play baseball at Hartford next year. Martin rewrote the Danvers record book, becoming the first player to reach 100 career points as he finished with 82 goals and 56 assists after scoring 39 times as a senior. A three-time EMass All-Star, he was named Northeast Conference MVP. Milbury was a defensive stopper in the middle, helping lead Brooks to the ISL title. He earned Defensive Player of the Year honors for his efforts and earned ISL and NEPSAC all-league honors for the second time. He will attend Lafayette. The prolific junior striker flawlessly shifted positions and roles as his Highlanders marched to a Division 1 North title. He scored 27 goals and had 28 assists and was named Greater Boston League MVP, EMass All-Star, All-State and All-New England. In four years as a starter he transformed from a deadly striker to a master of the midfield. Nine goals and 15 assists as a senior upped his career points total to 70 (32 goals, 38 assists) and earned him All-State honors for a third straight year. The All-State center back and Catholic Conference Player of the Year was the backbone of a defense that won consecutive league titles. In his tenure on the Prep’s back line his team had 24 shutouts and a 0.45 goals-against average. Savonen was named to the coaches All-State team, as well as being an EMass and Atlantic Coast League All-Star. The three-year starter has scored 20-plus goals the past two seasons. An honor roll student, he also plays for the Orleans Storm. A Cape Ann All-Star three straight seasons, the midfielder-forward notched 12 goals, had 11 assists, and was named league player of the year after leading the Chieftains to a 16-0-2 regular-season mark. He will play soccer at Siena. The Offensive Player of the Year in the ISL tallied 13 goals and nine assists in earning first-team NEPSAC All-Star honors. For his career the Bellingham resident totaled 23 goals and 19 assists. A two-time ISL first-team star, he also plays basketball at Roxbury Latin. The heart of the defense for Brimmer & May, Wright also popped in 10 goals and contributed nine assists to help lead his squad to an undefeated season in the MBIL’s Division 1. A two-time league MVP, he is also a lacrosse all-star. He will attend Clark. Yehoah drew a lot of attention from opposing defenses but still netted 13 goals and six assists in just 14 games. He earned NSCAA All-American honors as well as being a NEPSAC All-Star. He finishes his career with 38 goals in 42 games. He will attend Vermont. 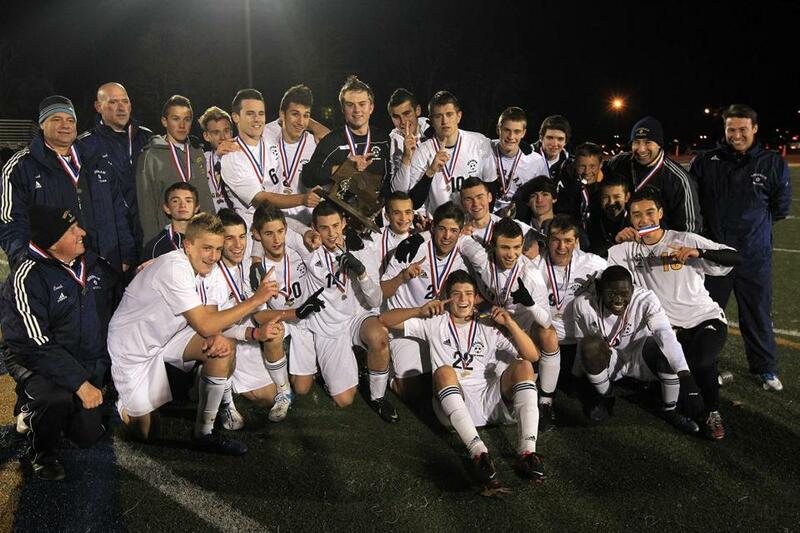 The father of Needham soccer guided the Rockets to their fourth state title in his 45 years. His game-planning paid off against the best teams in the state on Needham’s run to the Division 1 crown. A 21-1-3 record boosted Brock’s career totals to 662-179-117. A former Red Raider player, he guided his team to the program’s first EMass championship. They rolled to a 15-3-6 mark, were undefeated at home, and won the Division 3 North championship. He was named the EMass Soccer Coaches’ Association’s 2012 Coach of the Year. Tarbox concluded his 40-year career with a 423-206-88 record. His final team went 18-3-2, won the Merrimack Valley Conference title in their first year in the league, and captured their first Division 2 North title since 1999. Atlantic Coast — Marshfield: Evan Jastremski. Nauset: Cody Savonen. Bay State — Braintree: Adam Chin, Tom Mosey. Brookline: Eivend Molven. Dedham: Sean Birchall. Framingham: Bryant Nardizzi. Milton: Roy Butlin, Nick Savage. Natick: Dillon Foley, Matt Pease. Needham: Nolan Brady, Brandon Miskin, Mac Steeves. Newton North: Rob Morgan. Norwood: Tyler Goncalves. Walpole: Bobby Ivatts, John Lochhead. Wellesley: Adam Chernew, Tyler Kuckenbecke, Ryan Stuntz. Weymouth: Josh Berg, Jack Lynch, Mikey Lynch, Lucas Rezende-Verge. Big Three — Brockton: Samuel Fonseca, Joel Lobo, Edmar Vieira. Durfee: Derek Medeiros, Tyler Meneses, Hayden Tavares, Keith Worsley. New Bedford: Cameron Araujo, Ty Catunto, Osla DeBrito, Rui Dourado, Felipe Ponte, Kilsman Sousa. Boston City — Boston International: Danilton Fernandes, Bruno Pires, Stephen Teixeira. Brighton: Joshua DePina, Seth Phillistin, Cacho Rossel. Burke: Danilson Pina, Manuel Pires, Dony Resende. Charlestown: Mahamed Abdirahman, Gustavo Bendezu Villa, Hung Huynh. CASH: Gelson Gomes, Marc Thebaud, Stanley Ulysse. Dorchester: Warren Exceus, Tevin Reid, Jeffrey Valbrun. East Boston: Marvin Melgar, Jonathan Perez, Elmer Ventura. Latin Academy: Edwin Fuentes, Nikiander Pelari, Diego Villafuerte. Madison Park: Aloiso Barbosa, Edmilson Barros, Emiky Pires. O’Bryant: Fabio Cabral, Arlix Maldonado, Mendel Moise. Snowden: Hernan Escobar, Richard Lopez, Wilton Zuo. South Boston: Eric Dos Santos, Wilson Estrada. West Roxbury: Emmanuel Jean-Charles, Ricarfens Saintil, Rodler Ulysse. Cape Ann — Georgetown: Andrew Nowak. Hamilton-Wenham: Nick Fusco. Ipswich: Matt Jaegar, Slater Sullivan. Lynnfield: Pat Kearny. Manchester Essex: Chris Xavier. Masconomet: Chip Sherman, Tighe VanLenten. Newburyport: Jordy Steelman, Adam Traxler. North Reading: John Braga, Josh Intorcio. Pentucket: Zack Champman, Matt Farrell, Cody Sedler. Rockport: Connor Douglass. Catholic Central — Archbishop Williams: Aidan Browne, Ryan Crocker, Shane Moriarty, Dylan O’Brien. Arlington Catholic: Trevor Hamilton, Ben O’Brien. Austin Prep: Dan Ippolito, Matt Morgan, Mike Russell, Scott Vinchesi. Bishop Fenwick: Iftimi Arapi, Richard DaSilva, Greg Enos, Drew Thibodeau. Cardinal Spellman: Nick DeLuca, Lenny Paoletta, Evan Stimpson. Cathedral: Fausto DaRocha, Dennis Lopes. Cristo Rey: Joel Diaz, Kevin Martinez, Jardel Mendez. Lowell Catholic: Bernard Deignan, Dimitrious Dimou, Mathew Nachatelo, Brian Ngaruiya, Andrew Pereira. Marian: Aido Cortez, Kevin Crossman, Jungi Hong, Nick White. Matignon: Ryan Anglin, John Shanahan, Thomas Thompson, Nick Valdario, Hee Won Yun. Pope John: Mike DeRosa. St. Mary’s: Alexander Alleyne, Noah Camelo, Andrew Dimaiti, Helio Meirules Neto, Steven Stanko. Catholic Conference — BC High: Andrew Fontaine, Caleb Long, Zach Sanborn. Catholic Memorial: Pat Hurley, Todd MacDonald, Jack Torpey. Malden Catholic: Thales Brito, Joseph Russo. St. John’s Prep: Ben Alpern, Brooks Clark, Levon Kazalyan, Carter Ocko, Nate Schmidt. Xaverian: Brian Lowe. Commonwealth — Chelsea: Luis Cruz, Walter Guzman, Carlos Lainez, Hector Ramirez Diaz, Junior Rivera. Greater Lawrence: Miguel Batista, Carlos Colemanero, Chris Gomez. Greater Lowell: Dylan Bettencourt, Corey Goodwin, Gustavo Philot. Lynn Tech: Jose Alas, Francisco Franco, Douglas Sermeno, Edgar Vincente. Minuteman: Anthony Adams, Sergei Stone, Joel Zepeda. Mystic Valley: Giuseppe Iacovone, Scott Nguyen, Hari Perisic, Michael Russo-Penta. North Shore: Wilson Aquilar, Ron Donahue, Mike Reynolds, Cristian Scopa, Roy Sims. Northeast: Jean Carreiro, Edgar Roman, Dennis Torres. Shawsheen: T.J. Barriss, Mike Biondo, Dan Ferreri, Brian Gallagher, Jake Snook. Whittier: Luis Cortes, Jake Greene, Jon Hewey, Steve Quimby, Fabricio Torres. Dual County — Acton-Boxborough: Steve DeLeo, Andrew Doelp, Kakra Otoo, Ryan Rose, Ross Schulman. Bedford: Michael Dushman, Stephen Frazier, Craig Kelly, Peter Whallon. Boston Latin: Ulises Alvarez, Jake French. Concord-Carlisle: Scott Brazina, Greg Fauchet, Wyatt Powell, Stowe Simonton. Lincoln-Sudbury: Steven Ingard, Andrew Rosenblatt. Newton South: Thomas Stephens. Waltham: Francesco Fortunado, Michael Humbert, Justin McCassie. Wayland: Matt Edwards. Westford: Sam Brewer, Derrick Naugler, Ben Osgood, Jonathan Walsh. Weston: Peter Banks, Andrew Broomfield, Bailey Poritzky, Chason Timko. Eastern Athletic — Bishop Feehan: Andrew Humphrey, Robert Looney, Michael McShane, Zack Pina. Bishop Stang: Zack Carlson, Sarandon Dias, Jack Murphy. Coyle & Cassidy: Nate Biedak, Dan Borges, Billy Jencyowski, Michael Santos. Martha’s Vineyard: Rodrigo Honorato, Jack Roberts. Somerset Berkley: Zack Murphy. EIL — Bancroft: P.J. Lidonde. Beaver Country Day: Silmar Bueno, Michael Gray, Zachary Herivaux, Zack LaCava, Erik Reed. Berwick: Dexter Doucet, Jesse Morse, Chris Richards, Stephen Sherbahn. Concord Academy: Jack Anderson, David Lander, Malin Segal. Landmark: David Sacal. Lexington Christian: Dan Perez, Kevin Taylor. Pingree: Nathan Corning, Nathan Graves. Portsmouth Abbey: Coleman Clark, Robert Sucsy. Greater Boston — Cambridge: Jeremy Astesano, Callum Nelson, Bernardo Ponte. Everett: Wallef Noguira, Caio Simao. Malden: Rafael DaSouza, Prince Mukala, Lucas Silva. Medford: Matheus Anastacio, Jonathan Pires. Somerville: Marcello Brociner, Felix DeBona, Thayrone Miranda, Francisco Neto, Matheus Reis, Andre Rolim. Hockomock — Attleboro: Alain Laurent. Canton: Michael Denehy, Damian Kozak, Sam Larson. Franklin: Eric Hall, Joe Kalil, Zach Scafati. King Philip: John Keys, Aaron Morrissette. Mansfield: James Murphy. Milford: Justin Asam, Lucas DeAguiar, Jonathan O’Neil. North Attleborough: Cam Burns, Taylor Christo. Oliver Ames: Lucas Araujos, Chris Goncalves, David MacKinnon, David Stapleton. Sharon: Kevin Bartal, Ian Beach, Jake Steinberg. Stoughton: Michael Gallagher. Taunton: Danny Belair, Mike Shaheen. ISL — Belmont Hill: Will Cresap, Kyle Saidnawey. Brooks: Greg Conrad, Jory Makin, Sam Milbury, Samuel Milbury, Zach Vieira. BB&N: Fred Randall, Ryan Simpson. Groton: George Bukawyn, Chris Higginson, Ryan Meuth. Lawrence Academy: Christian Hernandez, Aziz Khan, Amandu Kunateh. Middlesex: Phil Skayne. Milton Academy: Michael Cooke, Michael Sheehan. Rivers: Trevor Davock, Matt Dias Costa, Declan McCabe, Bobby McSweeney, Steve Van Siclen. Roxbury Latin: Pat Barry, Andrew Wheeler-Omiunu. St. George’s: Juan Carlos De La Guardia. St. Mark’s: Grant Prudhomme, Sam Ward. St. Paul’s: Max Krieg. St. Sebastian’s: George Price. Thayer: Adam Cowie Haskell, Dom Quade. MBIL — Boston Trinity: Tim Griffith. BU Academy: Zach Biletch, Jacob Fucci. Brimmer & May: Quinn Iuliano, Enzo Landucci, Adrian Oliveira, Tony Wright, Aaron Yemane. Cambridge Weston: Max McGleughlin, Noah Rossen, Caleb Weiss. Chapel Hill: Max Jackson. Commonwealth: Alexander Curtiss, Parsa Mansouri. Covenant Christian: Samih Hamady, Caleb Hanna, Denzel Jones, Carlos Peixoto. Gann Academy: Jonah Kriger, Elie Lehmann. Learning Center: Chance Morgan. Newman Prep: Quoc Bui, Peter Girard, Saleh Ismail, Simon Machalek, Isaac Slaughter. Waldorf: Rio Liu. Waring: Ted Lyman, Teddy Lyman, Cam MacInnes, Charlie Mitchell, Kyle Patrick. Mass. Charter — Boston Collegiate: Ciaran Murphy, Aiden Rosa. Boston Prep: Emmanual Antoine. Community Charter: Tenzing Migjur. Foxborough Charter: Tyler Casper, Dan Rudd. Pacific Rim Charter: Darren Stephens. Pioneer Charter: Pedro Calegari, Jon Le, Craig Percoco. Salem Academy: Weylin Perez. South Shore Charter: Chad Burke. Mayflower — Bishop Connolly: Dean Sylveria. Blue Hills: Jostin Mara. Bristol-Plymouth: Matt Casses. Diman: Isaac Moniz, Fabio Souza. Holbrook: Colin Diaz, Brandon Spencer-Gomes, Brandon Walker, Youcef Ziad. Norfolk Aggie: Matt Timmons, Evan Witherbee. Old Colony: Andre D’Abruzzo, Andrew Frey, Kyle Soares. Sacred Heart: Tom Gerhard, Anthony Jordan, Kieran Kelleher, Kevin Strohschneider. Southeastern: Kenny Alves, John DePina, Jason Galarza, Andre Pereira, Jeffrey Pierre. Tri-County: Connor Strom. Upper Cape: Colin Jepson, Austin Smolinsky. West Bridgewater: Dominic Antonangeli, Justin Berglund, Reed Crowley, Tyler Taccini, David Yeo. Westport: Chris Hartnett. Merrimack Valley — Andover: Drew Johnson. Billerica: Ryan Santarpio, Dan Trainor, Leo Trindade. Central Catholic: Andrew Ayres. Chelmsford: Casey Hamill, Steve McLeod. Dracut: Mario Prata, Noah Teperow. Lawrence: Joseano Tavares. Lowell: Brandon Fahlberg, Eusebio Marote. Methuen: Salah Baladi, Kevin Echeverry, Luis Guerrero. North Andover: Connor Boudreau, Evan Dudney, Dennis Graef. Tewksbury: Zachary Jacobs. Middlesex (Freedom) — Burlington: Gerry Ramirez. Melrose: David Mendelssohn. Stoneham: Mike Andrews, Alex Brown, Brendan Donovan. Wakefield: Tom Sheerin, Andrew Taliaferro. Watertown: Cody Hecht, Greg Koutroukas, Shant Vosbigian, Vardan Yeghiyan. Wilmington: Colin Doherty, Drew Foley, Luke Foley, Kory McGilvray, Chris Michelangelo. Middlesex (Liberty) — Arlington: Lucas Munson, Kelan Nee. Belmont: Sam Kerans, Dan Martin, Chris Rizzo. Lexington: Matt Edmonds, Elliot Mustoe, Tom Stirrat, George Velonias. Reading: Lee Jacobs, Jonathan Millett. Winchester: Dan Boulanger, Kevin Calnan, Evan Carey, Zack Landau, Nicholas Stern. Woburn: Nick Dalton. Northeastern — Danvers: Eric Martin. Old Colony — Barnstable: Tyler Bennett, Gui Campos, Jose Erazo, Newton Jordao, Caio Mitre. Bridgewater-Raynham: Tyler Glavin, Mark Hamalian, Nick Myers, Tom Yung. Dartmouth: Lucas Almeida, Jarred Brandso, Kyle Gaffney, Noah Martins, Ben Silvia, Matt Vidal. Patriot — Duxbury: Drew Caliendo, Alex Kennelly, Peter Murphy, Matt Saia. Hanover: Hank Foster, Eric Miller, Billy Taylor, Chris Toohey, Brian Wheeler. Hingham: Ben Fisher, Evan Flanagan, Craig Hildreth, Jack Murray, Kevin O’Neill, Andrew Ricciardelli. Middleborough: Kenny Schofield, Mitchell Thompson. North Quincy: James McFarland, Robbie Routhier. Pembroke: Nick Blazo, Ryan Goodman. Quincy: Felix Nampanya, James O’Shea, Caique Reginaldo. Scituate: Chris DeAngelo, Joseph Desmond, Greg Logue, Chris Sylvester, Dave Sylvester. Silver Lake: Sam Ballerini, Paul Beatty, John Coneeny, Colin Grindle, Sean Hurlburt, Brendan Nemes. Whitman-Hanson: Alex Nicoletta. South Coast — Apponequet: Brendan Garafalo, Chris Mahala, Tim Rowley. Bourne: Lucas Cabral, Jack Canterbury. Dighton-Rehoboth: Evan Rosa. Fairhaven: Alec Dompierre, Kyle Everett. Greater New Bedford: Tim Amaral, Luis Carranza, Austin Fereira, Helio Viera. Old Rochester: Ted Costa. Seekonk: James Eline, Dan Saggal, Nick Smith. South Shore — Abington: Rob McClafferty, Jared Sumner. Carver: Kevin Aldrovani, Tyler Johnson. Cohasset: Joe Buckley, Patrick Federle, Nick Tangherlini. East Bridgewater: Jared Burns, Matt Crowley, Ethan Forest, Eric Sybertz. Hull: Christian Fuda. Mashpee: Romeo Grey, Scott Matoian, Nathan Peterson, Dylan Shute. Monomoy: Evan Milligan, Gage Schultz. Norwell: John Fisher, Peter Marchetti, Billy Sewell. Rockland: Kevin Strobel. Tri-Valley — Dover-Sherborn: Steven Aston, Sean Forward. Holliston: Taylor Gilfoy, Evan Vasilaukas, Troy Waddell. Medfield: Bikash Bhandori. Medway: John Aviza, Mike Barry, Matt Coakley, Danny Messina. Norton: Matt Sugar. Westwood: Olek Lis.